After playing such a sad, depressing (but still great) game in Child of Light, the happy, bright atmosphere of Kirby: Triple Deluxe was a welcome change. But once that set in, I was able to see it for what it really was — a decent platformer with challenges spread few and far between. Adorable pink puffball? Check. Various powers? Check. Compelling game? Eh. In Kirby: Triple Deluxe, Dream Land is in danger (surprise!). King Dedede is kidnapped by a mysterious being with six floating hands for an unknown purpose. 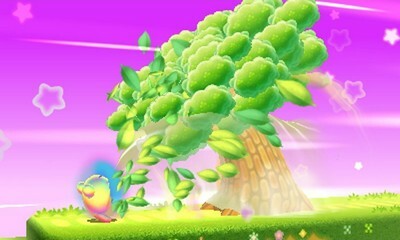 A giant beanstalk grows out of the ground, connecting the floating islands of Floralia that Kirby must save from this unknown evil being. His/her/it’s name isn’t even learned until the final boss sequence. Anyway, since this is a Kirby game, there are powers galore. I haven’t played a Kirby game since the SNES days with both Super Star and Dream Course, but I remember some of the old standbys like Cutter, Wheel, and Beam. Triple Deluxe also brings in some new powers like Bell, which equips Kirby with two giant bells, and Circus, allowing Kirby to bust out an array of acrobatic tricks like diving through hoops and making balloon animals. I was happy to see that the pause menu has a breakdown of each ability’s usage, like a fighting game showing a character’s move list. While most abilities have 10 or more moves, I found myself using the same one or two over and over. There is also a super power, for lack of a better term, in Hypernova. Kirby’s inhale scales up a thousand fold, turning him into a bonafide black hole capable of sucking up trees, buildings, and missiles. I didn’t like how often Hypernova was used, though. Once you get it, you have it for the rest of the level. I felt like it was used to mask the run-of-the-mill gameplay underneath. When Hypernova is oi, play the level itself is in danger. But it’s definitely overused. I’ll give it to the level designers of Kirby: Triple Deluxe, though. Each level feels very new and different from the one before it, keeping the game fresh (as if an endless list of copy abilities didn’t do that already). There are also some fun uses of tilting the 3DS, whether it be to move a cannon or tip a bowl of water to put out a fire. The system’s 3D effects are used spectacularly well, with different portions of levels taking place in the foreground and background, sometimes simultaneously. Each level also ends with a timing mini-game that shoots Kirby out of a cannon, which will net you a collectible if you hit it perfectly. But, the well-designed levels only go so far. Of the six worlds in the game, only the last one poses any real challenge and threat of actually dying. Floralia is full of plenty of collectibles, chief among them being keychains. There are 256 in all, each a sprite of a Kirby ability/enemy of the past. There are also sun stones, which are similar to stars in Super Mario 3D Land as you need to find a certain number of them in a world to unlock it’s boss stage. While it’s tough to find all the keychains (I only found about 120 different ones), the sun stones are pretty easy. I didn’t have to play through any level more than twice to find them all, as whenever I missed one I immediately knew where I had to go. Somebody spilled Smash Bros on my Kirby! I’m not sure if extra modes are the norm or not in Kirby games as I’ve only played two, but Triple Deluxe is packed with ways to enjoy it other than the main story. Right off the bat you have access to two: Kirby Fighters and Dedede Drum Dash. Fighters, pictured above, is very similar to Smash Bros in that it’s a free-for-all deathmatch. You choose a power and start on a gauntlet, ranging from one other Kirby to three and ending with a shadow copy of yourself. It feels a little too similar to a weaker, stripped-down Smash Bros for my liking, though. If I’m going to be fighting other players in a deathmatch, I’d like a full controller and a large TV. Dedede Drum Dash is a rhythm game, my second favorite one on the 3DS, where King Dedede bounces from left to right and collects coins. You’ll get bonus points for things like taking no damage and hitting all the timed button presses on each back beat. Completing the game gives you two more modes. First up is an arena mode, pitting Kirby against each of the game’s bosses in succession with a few max tomatoes and power swaps in between. This one is pretty tough. Lastly, and this one was my favorite, is Dedede Tour. King Dedede takes Kirby’s place as the playable character, essentially giving you a bigger, stronger Hammer ability at all times. Each world is compressed and remixed as you race against the clock to rush through as fast as you can. I found this almost as fun, maybe more so, than the main game. Visually, Triple Deluxe is sharp, although I saw some pretty noticeable copies/double-ups of various world objects with the slider all the way up. Colors span the entire rainbow and back, making for some very striking environments. The music, as expected, is almost always upbeat and charming. By no stretch is Kirby: Triple Deluxe a bad game. The levels are designed wonderfully, the 3D is great, and it’s very pretty. It’s just … I was never really compelled to play it. It was never, “Oh good, I have time for Kirby now!” but instead it was always, “well, I might as well get through some more of Kirby.” Maybe it was the almost complete lack of difficulty, although I didn’t expect a huge challenge. Kirby: Triple Deluxe has all the ingredients for a good game, but somehow doesn’t quite get it right.